A belated Happy New Year to you all from the Homestead! If you’re anything like us, you’re craving a liquifaction-truck load of fresh vegetables, a decent night’s sleep and to avoid any dessert requiring whipped cream for a good while. Our farm clothes may be a little snugger at the moment, but wasn’t it all fun while it lasted?! This Christmas season had two hugely contrasting features to set it apart from other years. The first injected a fair-sized dollop of glitz and glitter in the form of the Sydney Elders. Visitors at Christmastime are always extra-special, but this double act take it all to a different level. Their time here was split between visiting and revisiting, and checking out the inaugural Test at Christchurch’s purpose built (no rugby boots will be churning up this hallowed turf) Hagley Oval between the Black Caps and Sri Lanka. 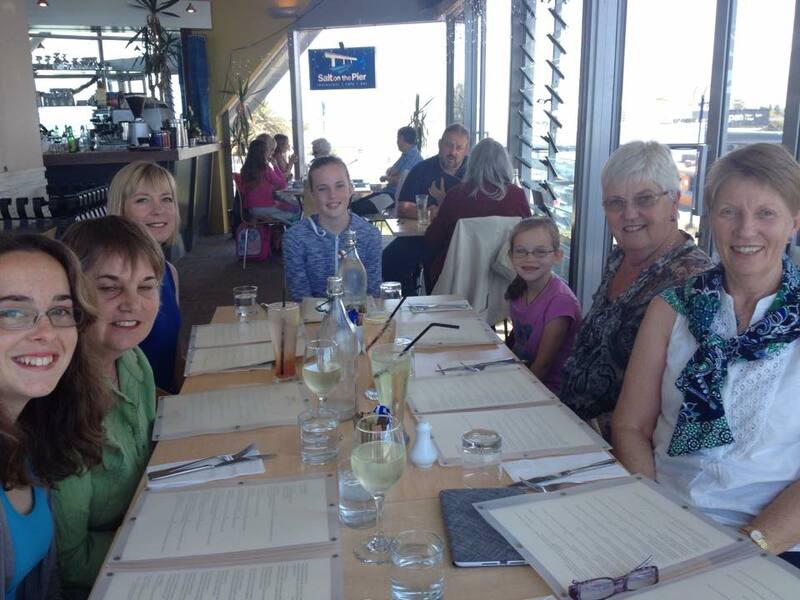 Such was the magnitude of this visit that it required a special sitting of the Ladies Lunchification. Thankfully the monsoon-like downpour on the day earmarked for their visit to the Homestead was all but gone by their arrival. The foliage sparkled in the watery sun and all residents (human, furred and feathered) proudly showed off our collective best side while our visitors seemed to appreciate our take on living the life. On the down side, The Bean Counter has not been his normal, jovial self this festive season as a persistent virus decided to zero in on his back, resulting in a prolapsed disc. It’s never as much fun when one of our number is under the weather but he’s definitely on the mend now. And so to 2015. Now that all the hoo-hah is over, we’re looking forward to getting back into the garden, lavishing a bit of attention on the animals and morning coffee on the deck. No resolutions here, we’re just focusing on having fun doing what we do on our little patch of the globe. 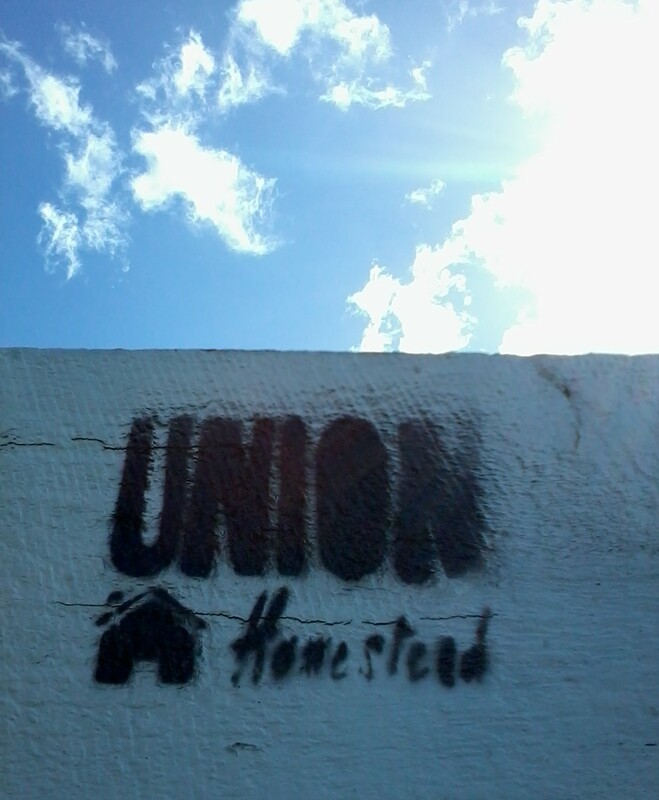 Happy, fun filled, aroha-driven 2015 to you all from Union Homestead. 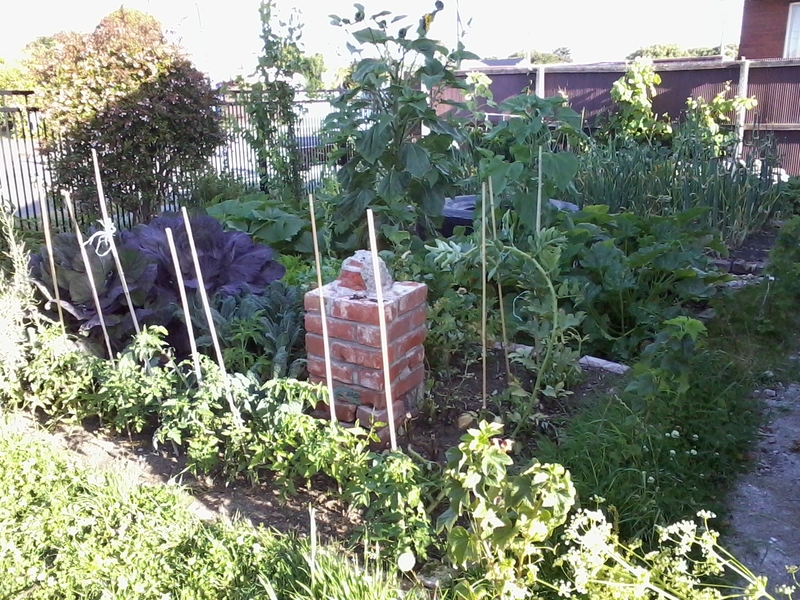 This entry was posted in Union Homestead and tagged 2014, 2015, allotment, Aotearoa, Boxing Day, Christchurch, Christmas, fresh vegetables, Homestead, Homesteader, homesteading, New Brighton, New Year, new years, New Zealand, Otautahi, prolapsed disc, resolution, Resolutions, slipped disc, small holding, smallholder, smallholding, visitors, whipped cream. Bookmark the permalink. Sounds as though you had a great time over the holiday period apart from the bad back sufferer. May 2015 be filled with interesting things to do, success in your various endeavours and plenty of fun! Thank you. Fun is what it’s all about! We await your next guided tour with great anticipation,. Well Happy New Year to you all too!! The garden looks heavenly and goats completely in Zen. My sympathies for the Bean Counter…I know this is eerie but I have the same issue since last summer. A bothersome affair, hopefully his will heal quicker! Poor Bean Counter..he can wine to me as much as needed. Sounds like you all have had a wonderful holiday, all in all. Best wishes from our home to yours! Back to real life, yes, it does feel like that a bit. School and university start up again on the 5th, hubby was back at work yesterday and I am back at that everlasting chicken fence. Speaking of chickens – those chicks!!!! By my estimate, they’re not quite a month old, but they look enormous – does Farmer know what breed the eggs derived from? Sorry to hear about Bean Counter’s back – I can relate actually, as I’m down on the floor 6 times a day doing back exercises for a similar issue, though mine came from bad lifting. My physio guy is a big fan of exercises and do it yourself – I go to him in desperation hoping for a zap of ultrasound or a tweak of a muscle that gives instant relief, and he nearly always assigns me more exercises and asks how I’m doing with the previously assigned ones. He’s no fun at all, but I will reluctantly admit that the exercises seem to do the trick, at least when I do them faithfully. The back set are from a Kiwi physical therapist actually – called the McKenzie Method, apparently. Your garden looks wonderful. So envious. I’m just thinking about seeds now, and should be thinking about finding flats and potting soil etc. Morning coffee on the deck. Count me in. I’ll bring the pig mug I got for Christmas – no one ever gets confused about which is my mug now :). You know us too well – Crema wouldn’t have noticed a drop in our attendance but was deemed unsuitable (no view) for this outing (not by any Homesteaders I hasten to add). 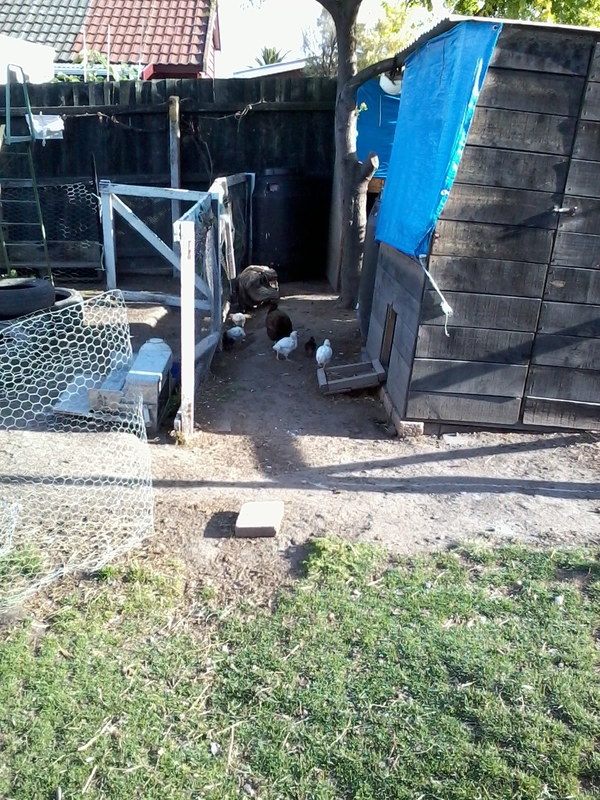 The chickens, particularly the four yellowy ones, are huge and not backwards in coming forwards while the little brown ones are still…well…little. Dad was a Coronation Sussex and there’s a rather long list of what the Mum could be. Who knows. Everyone is holding their breath, hoping the little frizzle is a girl. Good old Robin McKenzie! Yep, the Bean Counter is also grunting and groaning his way through those very exercises. Happy New Year. I hope that everything grows in abundance and that the goats don’t get to eat too much of it before you do. Happy New Year! Too right about the clothes – I sit here with my dogwalk trousers unbuttoned. I didnt unbutton them, they simply popped of their own accord. Happy New Year to you! 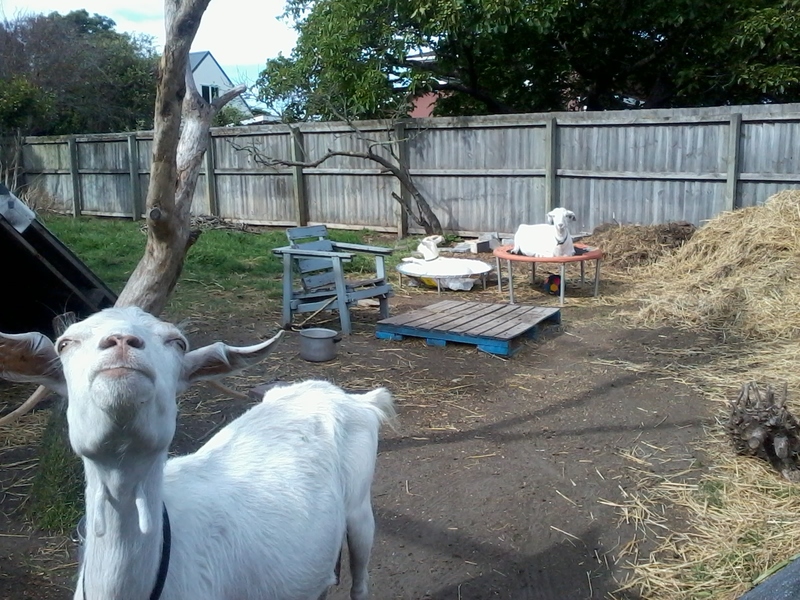 Looks like your garden is doing well and that the goats are happy. Hope you have a wonderful year!